Invisalign orthodontic system is free of braces and brackets. Invisalign is an orthodontic appliance system used to inconspicuously treat crooked and crowded teeth in adults and teens. It is the process of wearing a series of clear, removable aligners that gradually straighten your teeth. Invisalign clear aligners are made of flexible plastic. The aligners are thin, clear, and fit snugly over your teeth, making them virtually invisible. Invisalign clear aligners are FDA-approved and contain no BPA, BPS, latex, or gluten. Invisalign clear aligners are designed to apply the right amount of force to the right place at the right time to straighten your teeth. The aligners provide a slight resistance to the teeth, forcing them to move into alignment over time. 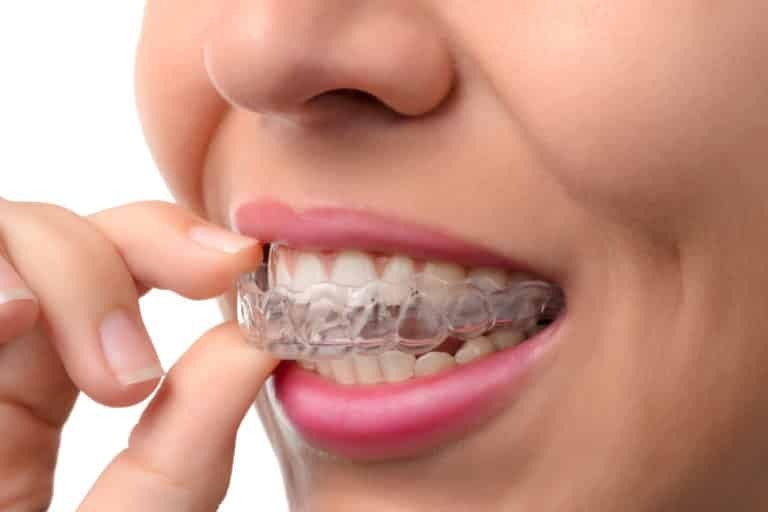 This modern take on braces features a system of clear aligner trays that are worn at all times with the exception of during meals and when brushing or flossing. The trays are custom fitted to the teeth, making them virtually unnoticeable when laughing, talking and eating with other people. Patients receive a sequence of trays, each of which is slightly different than the one before. Invisalign aligners are virtually invisible. Others may not even notice you’re wearing them, making Invisalign treatment a seamless fit with your lifestyle. You can remove your Invisalign aligners for eating, drinking, brushing, and flossing. You can take them off for special occasions, like a wedding, job interview, or for playing your favorite sport or instrument. Just remember to wear them 20 to 22 hours a day to get the best results. Smoking is discouraged while wearing Invisalign aligners because it can stain the aligners. With Invisalign, adults and teens can achieve the smiles they’ve always wanted without feeling self-conscious about the mode of treatment. Although there is no guarantee to have straight teeth with Invisalign treatment, your dentist will help you determine what Invisalign treatment can do to your smile. Dr Kaur recommends that anyone who has completed Invisalign treatment use a retainer to prevent teeth from gradually shifting back toward their initial position. Invisalign treatment can be a great solution for both adults and teens looking for a virtually invisible method to improve their smile. If you have crooked or crowded teeth that are embarrassing to you or otherwise preventing you from achieving optimal oral health, you can opt for invisalign treatment. With Invisalign aligners, it is possible to fix nearly all common teeth-straightening and bite issues, from simple to complex without interrupting your busy life. Visit your Invisalign dentist for a complete consultation to find out if you could benefit from clear orthodontics. Invisalign treatment starts with a consultation with an Invisalign-trained doctor. Your dentist Dr Harmanpreet Kaur will evaluate your smile and then map out a precise, customized digital treatment plan that showcases the step-by-step transformation of your smile. Each set of aligners that you will wear over the time will gently and gradually shift your teeth into place, according to your treatment plan, until you reach your beautiful new smile. You will wear your aligners nearly all of the time, with the exception of about two hours per day. Invisalign treatments are different for everyone, but most patients can achieve their ideal smiles within one to two years. The length of Invisalign treatment depends on multiple factors, like how complex your case is and how often you wear your aligners. Dr Kaur, a certified trained Invisalign specialist, will determine exactly how long your treatment will take based on your specific needs. On average, Invisalign treatment time is 12 to 18 months, though you can start seeing results in a matter of weeks. Our office will schedule regular appointments, usually about once every four to six weeks. The goal of dentist visits is to ensure your Invisalign treatment is progressing as planned. What is the cost of Invisalign treatment? In most cases, the cost of Invisalign treatment is similar to the cost of braces. Our office will determine the cost of your treatment based on how complex your case is and how many aligners you need. There are several options to make Invisalign treatment more affordable for you, from using insurance and tax-free dollars to a monthly payment plan. Please check our Patient Financing and payment plans for financing your Invisalign treatment.